Indicate by check mark whether the registrant is a large accelerated filer, an accelerated filer, a non-accelerated filer, smaller reporting company, or an emerging growth company. See the definitions of “large accelerated filer”, “accelerated filer”, “smaller reporting company”, and "emerging growth company" in Rule 12b-2 of the Exchange Act. The aggregate market value of the registrant’s voting shares held by nonaffiliates of the registrant as of June 30, 2017, based on the closing sale price per share as reported by the New York Stock Exchange on such date, was $7,393,482,685. As of February 1, 2018, the registrant had 286,465,036 shares of common shares outstanding. Applicable portions of the Proxy Statement for the 2018 Annual Meeting of Shareholders are incorporated by reference in Part III of this Form. Homebuilding, our core business, includes the acquisition and development of land primarily for residential purposes within the U.S. and the construction of housing on such land. We offer a broad product line to meet the needs of homebuyers in our targeted markets. Through our brands, which include Centex, Pulte Homes, Del Webb, DiVosta Homes, and John Wieland Homes and Neighborhoods, we offer a wide variety of home designs, including single-family detached, townhouses, condominiums, and duplexes at different prices and with varying levels of options and amenities to our major customer groups: first-time, move-up, and active adult. Over our history, we have delivered over 700,000 homes. Financial information for each of our reportable business segments is included in Note 3 to our Consolidated Financial Statements. Drive operational gains and asset efficiency in support of high returns over the housing cycle. Our Homebuilding operations are geographically diverse within the U.S. As of December 31, 2017, we had 790 active communities spanning 47 markets across 25 states. Sales prices of unit closings during 2017 ranged from approximately $100,000 to over $2,000,000, with 90% falling within the range of $200,000 to $750,000. The average unit selling price in 2017 was $395,000, compared with $373,000 in 2016, $338,000 in 2015, $329,000 in 2014, and $305,000 in 2013. The increase in average selling price in recent years resulted from a number of factors, including favorable market conditions, a shift in our sales mix toward move-up homebuyers, and changes in the geographical mix of homes sold. Our average unit selling price in 2016 was also impacted by our acquisition in January 2016 of substantially all of the assets of JW Homes ("Wieland), which are geared toward move-up homebuyers. Sales of single-family detached homes, as a percentage of total unit sales, were 88% in 2017, compared with 87% in 2016, 86% in 2015, 86% in 2014, and 85% in 2013. The increase in the percentage of single-family detached homes can be attributed to a shift in our business toward move-up homebuyers, who tend to prefer detached homes. Backlog, which represents orders for homes that have not yet closed, was $4.0 billion (8,996 units) at December 31, 2017 and $2.9 billion (7,422 units) at December 31, 2016. For orders in backlog, we have received a signed customer contract and customer deposit, which is refundable in certain instances. Of the orders in backlog at December 31, 2017, substantially all are scheduled to be closed during 2018, though all orders are subject to potential cancellation by or final negotiations with the customer. In the event of cancellation, the majority of our sales contracts stipulate that we have the right to retain the customer’s deposit, though we may choose to refund the deposit in certain instances. We acquire land primarily for the construction of homes for sale. We select locations for development of homebuilding communities after completing a feasibility study, which includes, among other things, soil tests, independent environmental studies and other engineering work, an evaluation of necessary zoning and other governmental entitlements, and extensive market research that enables us to match the location with our product offering to meet the needs of consumers. We consider factors such as proximity to developed areas, population and job growth patterns, and, if applicable, estimated development costs. We frequently manage a portion of the risk of controlling our land positions through the use of land option contracts, which enable us to defer acquiring portions of properties owned by land sellers until we have determined whether and when to exercise our option. Our use of land option agreements can serve to reduce the financial risk associated with long-term land holdings. We typically acquire land with the intent to complete sales of housing units within 24 to 36 months from the date of opening a community, except in the case of certain Del Webb active adult developments and other large master-planned projects for which the completion of community build-out requires a longer time period. While our overall supply of controlled land is in excess of our short-term needs in many of our markets, some of our controlled land consists of long-term positions that will not be converted to home sales in the near term. Accordingly, we remain active in our pursuit of new land investment. We may also periodically sell select parcels of land to third parties for commercial or other development if we determine that they do not fit into our strategic operating plans. Land is generally purchased after it is zoned and developed, or is ready for development, for our intended use. In the normal course of business, we periodically sell land not required by our homebuilding operations. Where we develop land, we engage directly in many phases of the development process, including: land and site planning; obtaining environmental and other regulatory approvals; and constructing roads, sewers, water and drainage facilities, and community amenities, such as parks, pools, and clubhouses. We use our staff and the services of independent engineers and consultants for land development activities. Land development work is performed primarily by independent contractors and, when needed, local government authorities who construct sewer and water systems in some areas. At December 31, 2017, we controlled 141,409 lots, of which 89,253 were owned and 52,156 were under land option agreements. We are dedicated to improving the quality and value of our homes through innovative architectural and community designs. Analyzing various qualitative and quantitative data obtained through extensive market research, we stratify our potential customers into well-defined homebuyer groups. Such stratification provides a method for understanding the business opportunities and risks across the full spectrum of consumer groups in each market. Once the needs of potential homebuyers are understood, we link our home design and community development efforts to the specific lifestyle of each consumer group. Through our understanding of each consumer group, we are able to provide homes that better meet the needs and wants of each homebuyer. Our homes targeted to first-time homebuyers tend to be smaller with product offerings geared toward lower average selling prices or higher density. Move-up homebuyers tend to place more of a premium on location and amenities. These communities typically offer larger homes at higher price points. Through our Del Webb brand, we are better able to address the needs of active adults, to whom we offer both destination communities and “in place” communities, for homebuyers who prefer to remain in their current geographic area. Many of these communities are highly amenitized, offering a variety of features, including golf courses, recreational centers, and educational classes, to the age fifty-five and over homebuyer to maintain an active lifestyle. In order to make the cost of these highly amenitized communities affordable to the individual homeowner, Del Webb communities tend to be larger than first-time or move-up homebuyer communities. historically played a major role in new housing, and we believe that our first-time homebuyer volume has been increasing recently and will continue to increase in coming years. We market our homes to prospective homebuyers through internet listings and link placements, mobile applications, media advertising, illustrated brochures, and other advertising displays. We have made significant enhancements in our tools and business practices to adapt our selling efforts to today's tech-enabled customers. In addition, our websites (www.centex.com, www.pulte.com, www.delwebb.com, www.divosta.com, and www.jwhomes.com) provide tools to help users find a home that meets their needs, investigate financing alternatives, communicate moving plans, maintain a home, learn more about us, and communicate directly with us. Our sales teams, in many cases together with outside sales brokers, are responsible for guiding the customer through the sales process. We are committed to industry-leading customer service through a variety of quality initiatives, including our customer care program, which seeks to ensure that homebuyers are comfortable at every stage of the process. Fully furnished and landscaped model homes physically located in our communities, which leverage the expertise of our interior designers, are generally used to showcase our homes and their distinctive design features. We are also introducing virtual reality walkthroughs of our house floor plans in certain communities to provide prospective homebuyers a more cost effective means to provide a realistic vision of our homes. We believe that we are an innovator in consumer-inspired home design, and we view our design capabilities as an integral aspect of our marketing strategy. Our in-house architectural services teams and management, supplemented by outside consultants, follow a 12-step product development process to introduce new features and technologies based on customer-validated data. Following this disciplined process results in distinctive design features, both in exterior facades and interior options and features. We typically offer a variety of house floor plans and elevations in each community, including potential options and upgrades, such as different flooring, countertop, fixture, and appliance choices, and design our base house and option packages to meet the needs of our customers as defined through rigorous market research. Energy efficiency represents an important source of value for new homes compared with existing homes and represents a key area of focus for our home designs, including high efficiency heating, ventilation, and air conditioning systems and insulation, low-emissivity windows, solar power in certain geographies, and other energy-efficient features. The construction of our homes is conducted under the supervision of our on-site construction field managers. Substantially all of our construction work is performed by independent subcontractors under contracts that generally are priced on a fixed-price basis. Using a selective process, we have teamed up with what we believe are premier subcontractors and suppliers to deliver quality throughout all aspects of the house construction process. system that can effectively link suppliers, contractors, and the production schedule. However, we cannot determine the extent to which necessary building materials and labor will be available at reasonable prices in the future. The housing industry in the U.S. is fragmented and highly competitive. While we are one of the largest homebuilders in the U.S., our national market share represented only approximately 3% of U.S. new home sales in 2017. In each of our local markets, there are numerous national, regional, and local homebuilders with whom we compete. Additionally, new home sales have traditionally represented less than 15% of overall U.S. home sales (new and existing homes). Therefore, we also compete with sales of existing house inventory and any provider of for sale or rental housing units, including apartment operators. We compete primarily on the basis of location, price, quality, reputation, design, community amenities, and our customers' overall sales and homeownership experiences. Operating as a captive business model targeted to supporting our Homebuilding operations, the business levels of our Financial Services operations are highly correlated to Homebuilding. For homes sold, we originated the mortgage loans of 66% in 2017, 65% in 2016, 65% in 2015, 61% in 2014, and 64% in 2013. Such originations represented substantially all of our total originations in each of those years. Our capture rate, which we define as loan originations from our homebuilding business as a percentage of total loan opportunities from our homebuilding business excluding cash settlements, was 80% in 2017, 81% in 2016, 83% in 2015, 80% in 2014, and 80% in 2013.
and costs inherent in servicing loans. This strategy results in owning the loans and related servicing rights for only a short period of time. At December 31, 2017, we employed 4,810 people, of which 879 people were employed in our Financial Services operations. Except for a small group of employees, our employees are not represented by any union. Contracted work, however, may be performed by union contractors. Our local and corporate management personnel are paid incentive compensation, which is generally based on a combination of individual performance and the performance of the applicable business unit or the Company. Each business unit is given a level of autonomy regarding employment of personnel, subject to adherence to our established policies and procedures, and our senior corporate management acts in an advisory capacity in the employment of subsidiary officers. We consider our employee and contractor relations to be satisfactory. Beginning in 2006 and continuing through 2011, the U.S. housing market was unfavorably impacted by severe weakness in new home sales attributable to, among other factors, weak consumer confidence, tightened mortgage standards, significant foreclosure activity, a more challenging appraisal environment, higher than normal unemployment levels, and significant uncertainty in the global economy. During this period, we incurred significant losses, including impairments of our land inventory and certain other assets. Since 2011, overall industry new home sales have increased, and we returned to profitability beginning in 2012. However, the recovery in housing demand has been slow by historical standards and the adjustments we have made to our operating strategy may not be successful if the current housing market were to deteriorate significantly. If the market value of our land and homes drops significantly, our profits could decrease and result in write-downs of the carrying values of land we own. The market value of land, building lots, and housing inventories can fluctuate significantly as a result of changing market conditions, and the measures we employ to manage inventory risk may not be adequate to insulate our operations from a severe drop in inventory values. We acquire land for expansion into new markets and for replacement of land inventory and expansion within our current markets. If housing demand decreases below what we anticipated when we acquired our inventory, we may not be able to make profits similar to what we have made in the past, we may experience less than anticipated profits, and/or we may not be able to recover our costs when we sell and build homes. When market conditions are such that land values are not appreciating, option arrangements previously entered into may become less desirable, at which time we may elect to forego deposits and pre-acquisition costs and terminate the agreement. In the face of adverse market conditions, we may have substantial inventory carrying costs, we may have to write down our inventory to its fair value, and/or we may have to sell land or homes at a loss. At times we have been required to record significant write-downs of the carrying value of our land inventory, and we have elected not to exercise options to purchase land, even though that required us to forfeit deposits and write-off pre-acquisition costs. Although we have taken efforts to reduce our exposure to costs of that type, a certain amount of exposure is inherent in our homebuilding business. If market conditions were to deteriorate in the future, we could again be required to record significant write downs to our land inventory, which would decrease the asset values reflected on our balance sheet and adversely affect our earnings and our stockholders' equity. The homebuilding industry is highly competitive for skilled labor and materials. Labor shortages in certain of our markets have become more acute in recent years as the supply chain adjusts to uneven industry growth. Additionally, the cost of certain building materials, especially lumber, steel, concrete, copper, and petroleum-based materials, is influenced by changes in local and global commodity prices as well as government regulation. During 2017, we experienced increases in the prices of some building materials and shortages of skilled labor in some areas. Increased costs or shortages of skilled labor and/or materials could cause increases in construction costs and/or construction delays. We may not be able to pass on increases in construction costs to customers and generally are unable to pass on any such increases to customers who have already entered into sales contracts as those sales contracts generally fix the price of the home at the time the contract is signed, which may be well in advance of the construction of the home. Sustained increases in construction costs may, over time, erode our margins, and pricing competition may restrict our ability to pass on any such additional costs, thereby decreasing our margins. We rely on subcontractors to perform the actual construction of our homes, and, in some cases, to select and obtain building materials. Despite our detailed specifications and quality control procedures, in some cases, subcontractors may use improper construction processes or defective materials. Defective products widely used by the homebuilding industry can result in the need to perform extensive repairs to large numbers of homes. The cost of complying with our warranty obligations may be significant if we are unable to recover the cost of repairs from subcontractors, materials suppliers and insurers. We also can suffer damage to our reputation, and may be exposed to possible liability, if subcontractors fail to comply with applicable laws, including laws involving actions or matters that are not within our control. When we learn about possibly improper practices by subcontractors, we attempt to cause the subcontractors to discontinue them and may terminate the use of such subcontractors. However, attempts at mitigation may not avoid claims against us relating to actions of or matters relating to our subcontractors. Our long-term ability to build homes depends on our acquiring land suitable for residential building at reasonable prices in locations where we want to build. We experience significant competition for suitable land as a result of land constraints in many of our markets. As competition for suitable land increases, and as available land is developed, the cost of acquiring suitable remaining land could rise, and the availability of suitable land at acceptable prices may decline. Any land shortages or any decrease in the supply of suitable land at reasonable prices could limit our ability to develop new communities or result in increased land costs. We may not be able to pass through to our customers any increased land costs, which could adversely impact our revenues, earnings, and margins. sell their current homes to potential buyers who need financing. These factors could adversely affect the sales or pricing of our homes and could also reduce the volume or margins in our financial services business. Our financial services business could also be impacted to the extent we are unable to match interest rates and amounts on loans we have committed to originate through the various hedging strategies we employ. These developments have had, and may continue to have, a material adverse effect on the overall demand for new housing and thereby on the results of operations for our homebuilding business. Mortgage interest expense and real estate taxes represent significant costs of homeownership, both of which are generally deductible for an individual’s federal and, in some cases, state income taxes. Any changes to income tax laws by the federal government or a state government to eliminate or substantially reduce these income tax deductions, as has been considered from time to time, would increase the after-tax cost of owning a home. On December 22, 2017, a law commonly known as the Tax Cuts and Jobs Act (the "Tax Act") was enacted. While the Tax Act lowers the tax rates applicable to many businesses and individuals, it also, among other things, (i) limits the federal deduction for mortgage interest so that it only applies to the first $750,000 of a new mortgage (as compared to $1 million under previous tax law), (ii) introduces a $10,000 cap on the federal deduction for state and local taxes, including real estate taxes, and (iii) eliminates the federal deduction for interest on home equity loans. While the ultimate impact of the Tax Act is not known, these tax changes may raise the overall cost of home ownership in certain of our existing or future communities, lessen the perceived financial benefits of home ownership, or otherwise reduce demand for our homes. Increases in real estate taxes by local governmental authorities also increase the cost of homeownership. Any such increases to the cost of homeownership could adversely impact the demand for and sales prices of new homes. The capital and credit markets can experience significant volatility. We may need credit-related liquidity for the future development of our business and other capital needs. Without sufficient liquidity, we may not be able to purchase additional land or develop land, which could adversely affect our financial results. At December 31, 2017, we had cash, cash equivalents, and restricted cash of $306.2 million as well as $764.5 million available under our revolving credit facility, net of outstanding letters of credit. However, our internal sources of liquidity and revolving credit facility may prove to be insufficient, and in such case, we may not be able to successfully obtain additional financing on terms acceptable to us, or at all. Another source of liquidity includes our ability to use letters of credit and surety bonds pursuant to certain performance-related obligations and as security for certain land option agreements and insurance programs. The majority of these letters of credit and surety bonds are in support of our land development and construction obligations to various municipalities, other government agencies, and utility companies related to the construction of roads, sewers, and other infrastructure. At December 31, 2017, we had outstanding letters of credit and surety bonds totaling $235.5 million and $1.2 billion, respectively. These letters of credit are generally issued via our unsecured revolving credit facility, which contains certain financial covenants and other limitations. If we are unable to obtain letters of credit or surety bonds when required, or the conditions imposed by issuers increase significantly, our financial condition and results of operations could be adversely affected. The U.S. housing industry is highly competitive. Homebuilders compete not only for homebuyers, but also for desirable land, financing, raw materials, skilled management, and labor resources. We compete in each of our markets with numerous national, regional, and local homebuilders on the basis of location, price, quality, reputation, design, community amenities, and our customers' overall sales and homeownership experiences. This competition with other homebuilders could reduce the number of homes we deliver or cause us to accept reduced margins to maintain sales volume. Competition can also affect our ability to procure suitable land, raw materials, and skilled labor at acceptable prices or other terms. We also compete with resales of existing or foreclosed homes, housing speculators, and available rental housing. Increased competitive conditions in the residential resale or rental market in the regions where we operate could decrease demand for new homes or unfavorably impact pricing for new homes. The loss of the services of members of our senior management or a significant number of our operating employees could negatively affect our business. Our success depends upon the skills, experience, and active participation of our senior management, many of whom have been with the Company for a significant number of years. If we were to lose members of our senior management, we might not be able to find appropriate replacements on a timely basis, and our operations could be negatively affected. Also, the loss of a significant number of operating employees in key roles or geographies where we are not able to hire qualified replacements could have a material adverse effect on our business. As of December 31, 2017, we had deferred tax assets, net of deferred tax liabilities, of $713.9 million, against which we provided a valuation allowance of $68.6 million. The ultimate realization of our deferred tax assets is dependent upon generating future taxable income. While we have recorded valuation allowances against certain of our deferred tax assets, the valuation allowances are subject to change as facts and circumstances change. The Tax Act enacted on December 22, 2017, makes broad and complex changes to the U.S. tax code, including, but not limited to, the following that impact us: (1) reducing the U.S. federal corporate income tax rate from 35 percent to 21 percent; (2) eliminating the corporate alternative minimum tax (“AMT”) and changing how existing AMT credits can be realized; (3) creating a new limitation on deductible interest expense; (4) repealing the domestic production activities deduction; (5) limiting the deductibility of certain executive compensation; and (6) limiting certain other deductions. While we continue to evaluate the effects of the Tax Act, we have recorded a net tax expense of $172.1 million in 2017 related to the remeasurement of our deferred tax balance and other effects. We expect that the Tax Act will have a favorable impact on our financial results beginning in 2018. In the absence of guidance on various uncertainties and ambiguities in the application of certain provisions of the Tax Act, we will use what we believe are reasonable interpretations and assumptions in applying the Tax Act. However, it is possible that the IRS could issue subsequent guidance or take positions in an audit that differ from our prior interpretations and assumptions, which could have a material adverse effect on our cash tax liabilities, results of operations, or financial condition. We have significant intangible assets related to business combinations. If the carrying value of intangible assets is deemed impaired, the carrying value is written down to fair value. This would result in a charge to our earnings. If management’s expectations of future results and cash flows decrease significantly, impairments of the remaining intangible assets may occur. Our operations are subject to building, safety, environmental, and other regulations imposed and enforced by various federal, state, and local governing authorities. New housing developments may also be subject to various assessments for schools, parks, streets, and other public improvements. These can cause an increase in the effective cost of our homes. Our financial services operations are also subject to numerous federal, state, and local laws and regulations. These include eligibility requirements for participation in federal loan programs and compliance with consumer lending and similar requirements such as disclosure requirements, prohibitions against discrimination, and real estate settlement procedures. They also subject our operations to examination by applicable agencies, pursuant to which those agencies may limit our ability to provide mortgage financing or title services to potential purchasers of our homes. For our homes to qualify for FHA or VA mortgages, we must satisfy valuation standards and site, material, and construction requirements of those agencies. uncertainties inherent in these matters, we cannot provide assurance that our insurance coverage, our subcontractor arrangements, and our reserves will be adequate to address all our warranty and construction defect claims in the future. Contractual indemnities can be difficult to enforce, we may be responsible for applicable self-insured retentions, and some types of claims may not be covered by insurance or may exceed applicable coverage limits. Additionally, the coverage offered by and the availability of general liability insurance for construction defects are currently costly and limited. We have responded to increases in insurance costs and coverage limitations by increasing our self-insured retentions and claim reserves. There can be no assurance that coverage will not be further restricted or become more costly. Additionally, we are exposed to counterparty default risk related to our subcontractors, our insurance carriers, and our subcontractors’ insurance carriers. Our homebuilding operations are located in many areas that are subject to natural disasters and severe weather. The occurrence of natural disasters or severe weather conditions can delay new home deliveries, increase costs by damaging inventories, reduce the availability of materials, and negatively impact the demand for new homes in affected areas. Furthermore, if our insurance does not fully cover business interruptions or losses resulting from these events, our earnings, liquidity, or capital resources could be adversely affected. In 2017, Hurricanes Harvey and Irma caused disruptions in our Texas and Florida operations, respectively, but did not result in a material impact to our 2017 results of operations. Inflation can adversely affect us by increasing costs of land, materials, and labor. In addition, significant inflation is often accompanied by higher interest rates, which may have a negative impact on demand for our homes. In an inflationary environment, economic conditions and other market factors may make it difficult for us to raise home prices enough to keep up with the rate of inflation, which would reduce our profit margins. Although the rate of inflation has been historically low for the last several years, we currently are experiencing increases in the prices of labor and materials above the general inflation rate. We use information technology and other computer resources to carry out important operational activities and to maintain our business records. Our computer systems, including our back-up systems, are subject to damage or interruption from power outages, computer and telecommunications failures, computer viruses, security breaches (through cyberattacks from computer hackers and sophisticated organizations), catastrophic events such as fires, tornadoes and hurricanes, and usage errors by our employees or cyber-attacks or errors by third-party vendors who have access to our confidential data, or that of our customers. While we are continuously working to improve our information technology systems and provide employee awareness training around phishing, malware, and other cyber risks to enhance our levels of protection, to the extent possible, against cyber risks and security breaches, and monitor to prevent, detect, address and mitigate the risk of unauthorized access, misuse, computer viruses and other events that could have a security impact, there is no assurance that advances in computer capabilities, new technologies, methods or other developments will detect or prevent security breaches and safeguard access to proprietary or confidential information. If our computer systems and our back-up systems are damaged, breached, or cease to function properly, or if there are intrusions of critical infrastructure such as the power grid or communications systems, we could suffer extended interruptions in our operations or unintentionally allow misappropriation of proprietary or confidential information (including information about our employees, homebuyers and business partners). Any such disruption could damage our reputation, result in market value declines, lead to legal proceedings against us by affected third-parties resulting in penalties or fines, and require us to incur significant costs to remediate or otherwise resolve these issues. We can be injured by improper acts of persons over whom we do not have control or by the attempt to impose liabilities or obligations of third parties on us. Although we expect all of our employees, officers, and directors to comply at all times with all applicable laws, rules, and regulations, there may be instances in which subcontractors or others through whom we do business engage in practices that do not comply with applicable laws, regulations, or governmental guidelines. When we learn of practices that do not comply with applicable laws or regulations, including practices relating to homes, buildings, or multifamily rental properties we build or finance, we move actively to stop the non-complying practices as soon as possible, and we have taken disciplinary action regarding employees of ours who were aware of non-complying practices and did not take steps to address them, including in some instances terminating their employment. However, regardless of the steps we take after we learn of practices that do not comply with applicable laws or regulations, we can in some instances be subject to fines or other governmental penalties, and our reputation can be injured, due to the practices' having taken place. The homes we sell are built by employees of subcontractors and other contract parties. We do not have the ability to control what these contract parties pay their employees or subcontractors or the work rules they impose on their employees or subcontractors. However, various governmental agencies are trying to hold contract parties like us responsible for violations of wage and hour laws and other work-related laws by firms whose employees are performing contracted for services. Governmental rulings or changes in state or local laws that make us responsible for labor practices by our subcontractors could create substantial exposures for us in situations that are not within our control. Our homebuilding and corporate headquarters are located in leased office facilities at 3350 Peachtree Road NE, Suite 150, Atlanta, Georgia 30326. Pulte Mortgage leases its primary office facilities in Englewood, Colorado. We also maintain various support functions in leased facilities in Tempe, Arizona, and Bloomfield Hills, Michigan. Our homebuilding divisions and financial services branches lease office space in the geographic locations in which they conduct their daily operations. Mr. Sheldon was appointed Executive Vice President, General Counsel and Corporate Secretary in March 2017. Prior to joining our company, he served as Executive Vice President, General Counsel and Secretary at Americold Logistics from June 2013 to March 2017 and in various legal positions at SuperValu from February 2008 to May 2013, most recently as Executive Vice President, General Counsel and Secretary. Mr. Ossowski was appointed Senior Vice President, Finance in February 2017 and previously held the positions of Vice President, Finance and Controller since February 2013 and Vice President, Finance - Homebuilding Operations since August 2010. At February 1, 2018, there were 2,325 shareholders of record. The Board of Directors approved a share repurchase authorization totaling $1.0 billion in July 2016, of which $94.4 million remained available as of December 31, 2017. During 2017, we repurchased 35.4 million shares under this program. In January 2018, the Board of Directors approved an increase of $500.0 million to our share repurchase authorization. There is no expiration date for this program. The following line graph compares, for the fiscal years ended December 31, 2013, 2014, 2015, 2016, and 2017, (a) the yearly cumulative total shareholder return (i.e., the change in share price plus the cumulative amount of dividends, assuming dividend reinvestment, divided by the initial share price, expressed as a percentage) on PulteGroup’s common shares, with (b) the cumulative total return of the Standard & Poor’s 500 Stock Index, and with (c) the Dow Jones U.S. 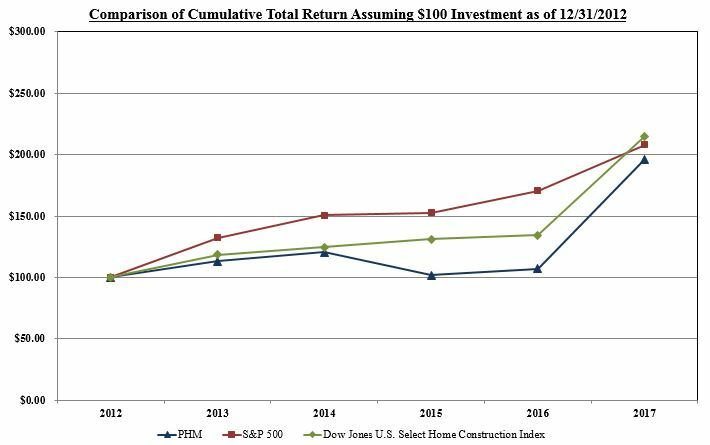 Select Home Construction Index. The Dow Jones U.S. Select Home Construction Index is a widely-recognized index comprised primarily of large national homebuilders. We believe comparison of our shareholder return to this index represents a meaningful analysis for investors. * Assumes $100 invested on December 31, 2012, and the reinvestment of dividends. Demand conditions continued to improve in the overall U.S. housing market in 2017. Although the recovery in housing demand has been slow by historical standards, the growth in demand for new homes is being supported by job creation, high consumer confidence, a supportive interest rate environment, and a limited supply of new homes. Within this environment, we remain focused on driving additional gains in construction and asset efficiency to deliver higher returns on invested capital. Consistent with our positive market view and long-term business strategy, we expect to use our capital to support future growth while consistently returning funds to shareholders through dividends and share repurchases. The nature of the homebuilding industry results in a lag between when investments made in land acquisition and development yield new community openings and related home closings. Our focus continues to be on adding volume growth to the efficiency gains we have achieved in recent years. Our prior investments are allowing us to grow the business, as evidenced by 11% growth in net new orders and a 12% increase in home sale revenues to $8.3 billion. We achieved this growth while also maintaining our focus on gross margin performance through community location, strategic pricing, and construction efficiencies. During 2017, we opened approximately 250 new communities across our local markets as a result of increased land investment over the last few years. This volume of new community openings can present a challenge in today's environment where entitlement and land development delays are common. We have grown our investment in the business in a disciplined manner by emphasizing smaller projects and working to shorten our years of land supply, including the use of land option agreements when possible. We have also focused our land investments on closer-in locations where we think demand is more sustainable when the market ultimately moderates. We have accepted the trade-off of having to pay more for certain land positions where we can be more confident in future performance. Leveraging our increased land investments, we expect to open a similar number of new communities in 2018 as in 2017, which we expect will help our volume grow in 2018. Repurchased $910.3 million of shares under our share repurchase plan. For additional information on the above, see the applicable Notes to the Consolidated Financial Statements. The increase in Financial Services income in 2017 compared with 2016 and 2015 was primarily due to an increase in mortgage origination volume resulting from higher volumes in the Homebuilding segment, partially offset by lower revenue per loan as the mortgage origination market has become more competitive. During 2015, we reduced our loan origination liabilities by $11.4 million, which favorably impacted Financial Services income. See Note 11. Our effective tax rate was 52.4%, 35.5% and 39.5% for 2017, 2016, and 2015, respectively. The effective tax rate for 2017 reflects the impact of the Tax Act, enacted on December 22, 2017. In connection with our initial analysis of the impact of the Tax Act, we have recorded a provisional amount of net tax expense of $172.1 million in the year ended December 31, 2017 related to the remeasurement of our deferred tax balance and other effects. See Note 8. Includes the amortization of capitalized interest; land inventory impairments of $89.0 million in 2017, $1.1 million in 2016, and $7.3 million in 2015 (see Note 2); and a warranty charge of $12.4 million related to a closed-out community (see Note 11) in 2017. Includes net realizable value adjustments on land held for sale of $83.6 million, $1.1 million, and $(0.9) million in 2017, 2016, and 2015, respectively (see Note 2). Includes write-offs of $29.6 million of insurance receivables associated with the resolution of certain insurance matters in 2017; general liability insurance reserve reversals of $95.1 million, $55.2 million and $62.2 million in 2017, 2016, and 2015, respectively (see Note 11); and restructuring costs from corporate office relocation and other actions of $10.0 million and $3.8 million in 2016 and 2015, respectively. Includes an $8.0 million impairment of an investment in an unconsolidated entity in 2017 (see Note 2); $15.0 million in 2016 related to the settlement of a disputed land transaction; $20.0 million in 2015 resulting from the Applecross matter (see Note 11); and restructuring costs from corporate office relocation and other actions of $11.6 million and $2.5 million in 2016 and 2015, respectively. See "Other expense, net" for a table summarizing other significant items. Home sale revenues for 2017 were higher than 2016 by $0.9 billion, or 12%. The increase was attributable to a 6% increase in the average selling price and a 6% increase in closings. The increase in closings reflects the significant land investments we have made and the resulting increase in our active communities. These increased closings occurred despite the disruption in our operations caused by Hurricane Harvey in Houston, Texas, and Hurricane Irma in Florida, as well as permitting and other municipal approval delays in certain communities. The higher average selling price for 2017 reflected a shift toward move-up homebuyers. Home sale revenues for 2016 were higher than 2015 by $1.7 billion, or 29%. The increase was attributable to a 10% increase in the average selling price and a 16% increase in closings. These increases reflect the impact of communities acquired from Wieland during the period, which contributed 6% to the growth in revenue, 4% to the growth in closings and 1% to the increase in average selling price. Excluding the communities acquired from Wieland, the increase in closings reflects the significant investments we made in opening new communities combined with improved demand. The increase in average selling price reflected a shift in our revenue mix toward move-up homebuyers. Home sale gross margins were 22.4% in 2017, compared with 25.0% in 2016 and 26.9% in 2015. Our results in 2017 include the effect of the aforementioned land inventory impairments totaling $89.0 million (see Note 2) and a warranty charge of $12.4 million (See Note 11). Combined, these factors reduced gross margin in 2017 by 120 basis points. The assets acquired from Wieland contributed 60 basis points to the decrease in 2016, primarily as the result of required fair value adjustments associated with the acquired homes in production and related lots. Gross margins remain strong relative to historical levels and reflect a combination of factors, including shifts in community mix, relatively stable pricing conditions in 2017 following strong pricing conditions in 2016 and 2015, and lower amortized interest costs (1.7%, 1.7%, and 2.4% of home sale revenues in 2017, 2016, and 2015, respectively) combined with higher house construction and land costs as the supply chain has responded to the housing recovery. We periodically elect to sell parcels of land to third parties in the event such assets no longer fit into our strategic operating plans or are zoned for commercial or other development. Land sale revenues and their related gains or losses vary between periods, depending on the timing of land sales and our strategic operating decisions. Land sales contributed net gains (losses) of $(77.3) million, $3.9 million, and $12.7 million in 2017, 2016, and 2015, respectively. The loss in 2017 resulted from the aforementioned net realizable value charges of $83.6 million (see Note 2). SG&A as a percentage of home sale revenues was 10.7% and 12.8% in 2017 and 2016, respectively. The gross dollar amount of our SG&A decreased $65.6 million, or 7%, in 2017 compared with 2016. SG&A includes the aforementioned insurance receivable write-offs of $29.6 million in 2017 and general liability insurance reserve reversals of $95.1 million and $55.2 million in 2017 and 2016, respectively, resulting from favorable claims experience (see Note 11). Excluding these items, the improvement in our year-over-year SG&A leverage was primarily attributable to cost efficiencies realized in late 2016 that continued into 2017. SG&A as a percentage of home sale revenues was 12.8% and 13.7% in 2016 and 2015, respectively. The gross dollar amount of our SG&A increased $162.4 million, or 20%, in 2016 compared with 2015. SG&A included general liability insurance reserve reversals of $55.2 million and $62.2 million in 2016 and 2015, respectively (see Note 11). SG&A also reflects restructuring costs of $10.0 million in 2016 associated with actions taken to reduce overheads and the substantial completion of our corporate headquarters relocation from Michigan to Georgia, which began in 2013. Excluding these items, the improvement in our year-over-year SG&A leverage was even greater. The increase in gross dollar SG&A reflects the addition of field resources and other variable costs related to increased production volumes combined with higher costs related to healthcare and professional fees. Additionally, SG&A for 2016 reflects the impact of transaction and integration costs associated with the assets acquired from Wieland in January 2016 (see Note 1). Lease exit and related costs for 2016 and 2015 resulted from actions taken to reduce overheads and the substantial completion of our corporate headquarters relocation from Michigan to Georgia, which began in 2013. Includes an $8.0 million impairment of an investment in an unconsolidated entity in 2017 (see Note 2). Miscellaneous, net includes a charge of $15.0 million in 2016 related to the settlement of a disputed land transaction and a charge of $20.0 million in 2015 resulting from the Applecross matter (see Note 11). Net new orders increased 11% in 2017 compared with 2016. The increase resulted primarily from the higher number of active communities, which increased 9% to 790 at December 31, 2017. Net new orders in dollars increased by 21% compared with 2016 due to the growth in units combined with the higher average selling price. The cancellation rate (canceled orders for the period divided by gross new orders for the period) decreased in 2017 from 2016 at 14% and 15%, respectively. Ending backlog units, which represent orders for homes that have not yet closed, increased 21% at December 31, 2017 compared with December 31, 2016 as measured in units and increased 35% over the prior year period as measured in dollars. The higher average sales price when compared to 2016 also contributed to the higher backlog dollars. Net new orders increased 13% in 2016 compared with 2015. The increase resulted from improved sales per community combined with selling from a larger number of active communities, which increased 17% to 726 active communities at December 31, 2016. The communities acquired from Wieland contributed to this growth in units by 4%. Excluding the Wieland assets, our growth in net new order units resulted from the higher number of active communities combined with a small improvement in sales pace per community. The cancellation rate increased slightly in 2016 from 2015 at 15% and 14%, respectively. Ending backlog units increased 10% at December 31, 2016 compared with December 31, 2015 and increased 20% as measured in dollars due to the increase in average selling price. The higher average sales price also contributed to the higher backlog dollars. strategy, we will continue to maintain reasonable inventory levels relative to demand in each of our markets, though inventory levels tend to fluctuate throughout the year. Of our controlled lots, 89,253 and 99,279 were owned and 52,156 and 43,979 were under land option agreements at December 31, 2017 and 2016, respectively. While competition for well-positioned land is robust, we continue to pursue strategic land positions that drive appropriate returns on invested capital. The remaining purchase price under our land option agreements totaled $2.5 billion at December 31, 2017. These land option agreements generally may be canceled at our discretion and in certain cases extend over several years. Our maximum exposure related to these land option agreements is generally limited to our deposits and pre-acquisition costs, which totaled $208.0 million, of which $11.8 million is refundable, at December 31, 2017. Includes land-related charges of $191.9 million, $19.3 million, and $11.5 million in 2017, 2016, and 2015, respectively (see Note 2). Northeast includes a charge of $15.0 million in 2016 related to the settlement of a disputed land transaction and a charge of $20.0 million in 2015 resulting from the Applecross matter (see Note 11). Florida includes a warranty charge of $12.4 million in 2017 related to a closed-out community (see Note 11). Other homebuilding includes amortization of intangible assets and capitalized interest and other items not allocated to the operating segments, including write-offs of $29.6 million of insurance receivables associated with the resolution of certain insurance matters in 2017 and general liability insurance reserve reversals of $95.1 million, $55.2 million, and $62.2 million in 2017, 2016, and 2015, respectively (see Note 11). Land-related charges include land impairments, net realizable value adjustments for land held for sale, and write-offs of deposits and pre-acquisition costs. Other homebuilding consists primarily of write-offs of capitalized interest resulting from land-related charges. See Notes 2 and 3 to the Consolidated Financial Statements for additional discussion of these charges. The length and complexity of the entitlement process in the Northeast have led to a lack of growth in volumes in recent years. For 2017, Northeast home sale revenues remained flat compared with 2016 due to a 6% decrease in closings offset by a 6% increase in average selling price. The decrease in closings occurred in the New England and Mid-Atlantic markets, while the increased average selling price occurred across all markets. The New England closings decrease was driven primarily by closings delayed as the result of a fire in an attached product building that was under construction and is in the process of being rebuilt. The decreased income before income taxes resulted from lower margins and increased overhead expense across all markets, combined with the aforementioned land-related charges recognized in the period (see Note 2). Net new orders increased across all markets. For 2016, Northeast home sale revenues increased 2% compared with 2015 due to a 5% decrease in closings offset by an 8% increase in average selling price. The decrease in closings occurred in the Northeast Corridor and Mid-Atlantic markets while the increase in average selling price occurred across all markets. The decreased income before income taxes resulted from lower margins in Mid-Atlantic and increased overhead expense in both Mid-Atlantic and the Northeast Corridor. Net new orders decreased 8%, primarily in the Northeast Corridor and Mid-Atlantic. Northeast income before income taxes also includes a charge of $15.0 million related to the settlement of a disputed land transaction in 2016 and a charge of $20.0 million resulting from the Applecross matter in 2015 (see Note 11). For 2017, Southeast home sale revenues increased 5% compared with 2016 due to a 5% increase in the average selling price. The increase in the average selling price occurred across all markets except Georgia, while closings decreased in Raleigh, Charlotte and Coastal Carolinas, offset by increases in Georgia and Tennessee. Income before income taxes decreased 16% primarily due to the aforementioned land-related charges, partially offset by lower overhead costs. Net new orders increased 11%, primarily in Georgia and Raleigh.